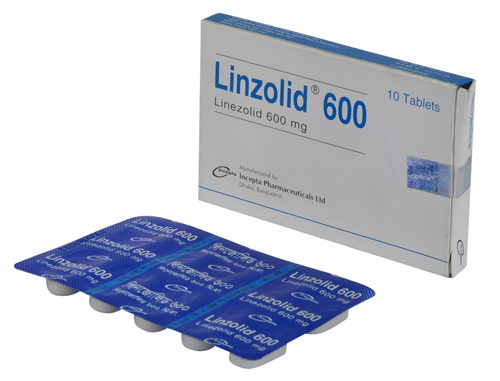 Linzolid 600 Tablet: Each film-coated tablet contains Linzeolid INN 600 mg.
Linzolid (Linzolid) is a synthetic, antibacterial agent belonging to a new class of antibiotics, the oxazolidinones, with in vitro activity against Gram positive aerobic bacteria, some Gram positive anaerobic bacteria and certain Gram negative bacteria. It selectively inhibits bacterial protein synthesis via a mechanism of action different from that of other antibacterial agents. Linzolid binds to the 23S ribosomal RNA of the 50S subunit of the bacterial ribosome and prevents the formation of a functional 70S initiation complex which is an essential component of the bacterial translation process. The results of time-kill studies have shown Linzolid to be bacteriostatic against enterococci and staphylococci. For streptococci, Linzolid was found to be bactericidal for the majority of strains. • Vancomycin-Resistant Enterococcus faecium infections including cases with concurrent bacteremia. • Nosocomial pneumonia caused by Staphylococcus aureus (methicillin-susceptible and -resistant strains) or Streptococcus pneumoniae (including multi-drug resistant strains). Combination therapy may be clinically indicated if the documented or presumptive pathogens include Gram-negative organism. • Complicated skin and skin structure infections, including diabetic foot infections (without concomitant osteomyelitis) caused by Staphylococcus aureus (methicillin-susceptible and ¬resistant strains), Streptococcus pyogenes, or Streptococcus agalactiae. Patients who commence treatment on the parenteral formulation may be switched to either oral presentation when clinically indicated. 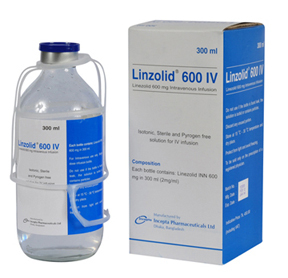 In such circumstances, no dose adjustment is required as Linzolid (Linezolid) has an oral bioavailability of approximately 100%. The injection should be administered over a period of 30 to 120 minutes. The film coated tablets or oral suspension may be taken with or without food. • Complicated skin and skin structure infections & Community-acquired pneumonia, including concurrent bacteremia: 600 mg IV or oral b.i.d. for 10 to 14 days. • Vancomycin-resistant Enterococcus faecium infections, including concurrent bacteremia: 600 mg IV or oral b.i.d.for 14-28. Neonates < 7 days: Most pre-term neonates < 7 days of age (gestational age < 34 weeks) have lower systemic linezolid clearance values and larger AUC values than many full-term neonates and older infants. These neonates should be initiated with a dosing regimen of 10 mg/kg every 12 hours. Consideration may be given to the use of 10 mg/kg in every eight hours regimen in neonates with a sub-optimal clinical response. All neonatal patients should receive 10 mg/kg t.i.d. by 7 days of life. Most of the adverse events reported with Linzolid were mild to moderate in intensity. The most common adverse events in patients treated with Linzolid were diarrhea, headache and nausea. Other adverse included oral moniliasis, vaginal moniliasis, hypertension, dyspepsia, localized abdominal pain, pruritus, and tongue discoloration. Patients who develop recurrent nausea or vomiting, unexplained acidosis, or low bicarbonate level while receiving Linzolid should receive immediate medical evaluation. Where administration of Linzolid and concomitant serotonergic agents is clinically appropriate, patients should be closely observed for signs and symptoms of serotonin syndrome such as cognitive dysfunction, hyperpyrexia, hyper reflexia and incoordination. If signs or symptoms occur physicians should consider discontinuation of either one or both agents. If the concomitant serotonergic agent is withdrawn, discontinuation symptoms can be observed. If patients experience symptoms of visual impairment, such as changes in visual acuity, changes in color vision, blurred vision, or visual field defect, prompt ophthalmic evaluation is recommended. Convulsions have been reported in patients when treated with Linzolid. In some of these cases, a history of seizures or risk factors for seizures was reported. Pregnancy: Pregnancy Category C. There are no adequate and well-controlled studies in pregnant women. Linzolid should be used during pregnancy only if the potential benefit justifies the potential risk to the fetus. Lactation: It is not known whether Linzolid is excreted in human milk. 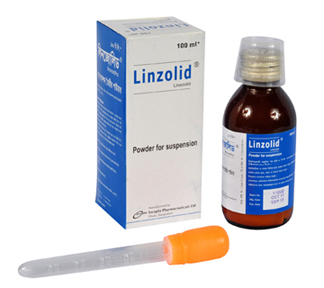 Because many drugs are excreted in human milk, caution should be exercised when Linzolid is administered to a nursing woman.